Driving the kids to school this morning, I was remembering our dinner conversation last night. Over some homey pasta, Tyler was telling us about a book he's reading, in which the main character chooses to trade places for one week with someone else. This, of course, prompted a lively discussion of: "Who would you trade places with?" 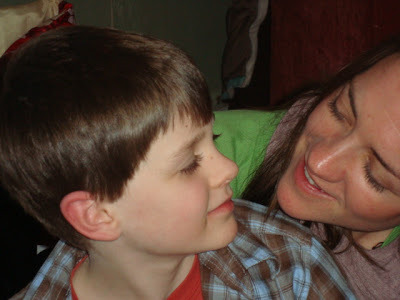 And my dear, wise 9 year old son, being the superstar that he is, stated: "I wouldn't trade places with anyone. I'm happy being me." Oh, be still my grateful heart! Now that is something to hear from your child. The words that tell you he's got his head on just right, he's confident and secure in himself, and we just may be doing a decent job parenting him. Now, to be honest, the rest of us in the family weren't quite so impressive and empowered in our wishes. Devin, age 6, wishes to be a princess. Ahem. Stuart would like to be Kelly Slater for a week, to experience what it's like to be the best surfer in the world...and to maybe learn a few wave riding tricks. And me? Well, I just wished to exchange singing voices with someone who can carry a tune. Maybe rock it out a little. (Not that I don't rock it out...just might hurt your ears a wee bit.) Sia, maybe, Bic Runga...someone with some serious soul. All in all though, I think the Kings are feeling pretty lucky and grateful to just be us. Life is a pretty good thing, I must say. In the spirit of a Well Fed Soul, perhaps I'll make this a recurring weekly post...sharing a little something that makes me pause, in the middle of a normal, hectic, often chaotic day, to say: "Thank you. That was just right."